Utö FM-DX-started! 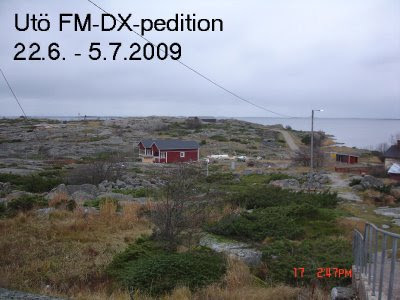 Two listeners are now in distant Finnish Utö-island for FM-DX and later four listeners will join them this Friday, including me! This pedititon is up from 22.6 till 5.7.2009. You can read Utö-pedition highlights from http://www.uto-fmdx.blogspot.com/. 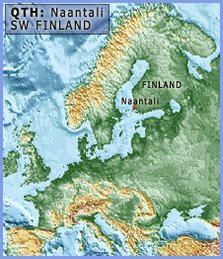 On Monday morning after 07utc some weak Arabic, Turkish and Ukrainan stations noted in South Finland, but nothing here. Sunday morning brought us nice conditions to Spain, France and even North Africa! Unfortunately I had to be at work for the best opening time because of one quick illness! I had to run out local church service for our local station in Salo (Radio Melodia, Salo, 88.2). In South Finland Algeria, Morocco and Tunisia was up among many Spanish stations. These are quite rare in Finland although Algeria I have heard many times. This needs douple-hop for sure (3000 km). Spanish stations were from Andalucia, South Spain, having about 3300 km skip. Nothing special heard by me but I losed the best moments. 94.7 - UNID, possibly Radio Tlemcen, Nador, Algeria because this was the only signal up at the same time with 88.4 MHz (Nador-tx-site). I was very lucky to notice very weak signals from Turkey today after 13utc!! During about 10 minutes I heard only one Turkish commercial station on 88.0 MHz (no other Es-signals)!! With the help from Marko Weck from Finland it is tracked this to be a station from Biga-city, about 170 km south west from Istanbul. It seems this is Radio Pegai (www) from Biga!! Here is a clip from the station's commercial-break: mp3!! Tuned 18.6.2009 on 88.0 MHz at 13.08utc. These kind of weak distant signals are the most interesting!! On Tuesday evening, 16.6. (1745utc >), there were 20+ minutes long condition to North Italy. Signals were quite strong giving RDS but MUF was not higher than 97 MHz. 88.8 - Radio DJ. They have very creative programme jingles-efects-production also in Italy (French stations are clear leaders in sound-production in Europe)!! Sun 14.6.2009: Benelux and Denmark on FM ! The beginning of summer 2009 has been very very poor. Only two brief 1-2 minutes long openings to south... One of the worst starts ever! Finally on Sunday evening 14th of June we had something happening. There were stations mainly from Holland but also some from Belgium, France, Germany and Luxembourg, mainly strong high-power stations. Unfortunately this was not good condition and it lasted 50 minutes. The highlight of the day was Denmark ! It is very rare here in SW Finland because the skip is so short. I identified Skala FM (www) from Esbjerg, on 87.6 and 88.4 MHz playing Top 40-programme. Here is mp3 from 88.4 MHz, playing "Human" by Killers after ID. 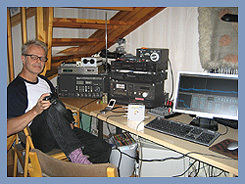 The other Danish was Nova FM tentatively on 89.3 MHz. Here some loggings from this day. Times UTC. May 2009 was very poor in Es-conditions. Weak openings to France and Italy (18.5 and 25.5). Es-clouds have been mostly lying over Switzerland and that is too far to give FM-signals to Finland! I have now added Triax FM88108-amplifiers to my Triax 8-el. yagis (V and H). Luckily Sony XDR can handle more local power-signals with no overloading!! That was good news. Now I am listening Skärgårds Radio 90.2 from Stockholm's coast with strong signal. More power than last summer?? ?